Atole (three syllables: ah-TOH-leh) is a thick, hearty, maize-based hot drink native to Mexico and Central America, where it is consumed as a breakfast drink or sipped as a comforting warm-up food during cold weather. It is often given to small children or the very elderly as a vital, easy-to-eat nutritional supplement. In its original, pre-Spanish Conquest form, the liquid used to prepare atole was always water; nowadays it is prepared with water or with milk or a combination of both. The traditional sweetener for atole is piloncillo, but brown sugar, white sugar, or honey can also be used. The drink is often seasoned with aromatic elements such as cinnamon, vanilla, anise, or cacao/chocolate, or mixed with a fruit puree to make atole de sabor (flavored atole). Heat water or milk in a medium-sized saucepan and add the piloncillo or sugar; cook and stir until sweetener is dissolved. Create the masa harina slurry by blending the masa harina with the 1/4 cup warm water. Add the masa harina slurry, vanilla, cinnamon, and salt to the pot. Bring to a simmer and continue to cook, stirring frequently, for 20 to 25 minutes until thickened to the consistency that you prefer. Remove cinnamon stick and/or vanilla bean, if using. Pour into mugs (rustic clay ones, if you have them) or thick glasses. Sip atole carefully, stirring often with a spoon in the cup, as it tends to stay very hot when not stirred. Make sure children’s portions have cooled down somewhat before serving them. To make fruit-flavored atole, stir 1/2 cup of pureed fruit into the mixture while cooking. Fruits commonly used for this purpose in Mexico include strawberries, guava, pineapple, blackberries, plums, and mangos. Atole is very frequently paired with tamales to make a filling, spirit-lifting breakfast, snack, or late dinner, most often in cold or cool weather. It is also consumed on late-night festive occasions such as Day of the Dead (November 1 and 2) and the December holidays, as well as at funeral wakes. Cooks in some areas of central and southern Mexico prepare a savory atole known as chileatole. Instead of piloncillo and fruit, chileatole contains hot peppers, spices or herbs such as epazote, and corn kernels. Although it has traditionally been made only with ground maize, nowadays atole is sometimes prepared with rice or wheat flour. The drink is sometimes made with cacao. 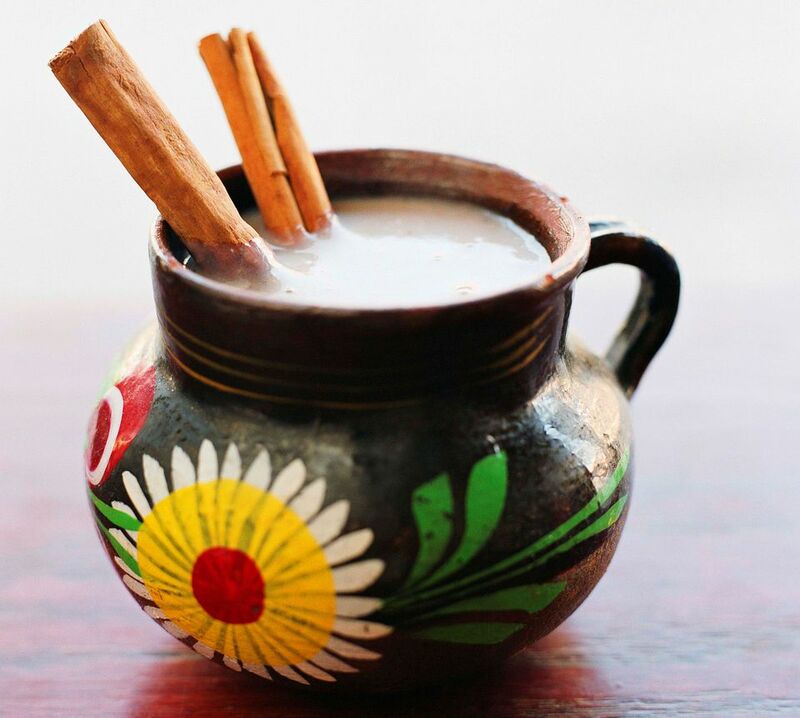 This Mexican chocolate-flavored atole is so good that it has its own name: champurrado.